The city of Zippori, founded in the Hellenistic/Maccabees era by Alexander Janneus, is located on hill in the Lower Galilee half way between the Kinneret (Sea of Galilee) and the Mediterranean Sea. Josephus Flavius, a first century C.E. historian, described it as “the ornament of all Galilee.” The city’s name may have originated from the Hebrew word “tsipor” meaning bird and highlighting the view from the top of the hill. The city may get its name from the Hebrew word “tsipor” (bird) because the view from the town gives a sense of flying. Zippori, was conquered by the Romans in 37 B.C.E but during the revolt against Rome in 66 C.E., the Jews of Zippori elected not to take arms; conversely they opened the city gates to the legions of Roman Emperor Vespasian. 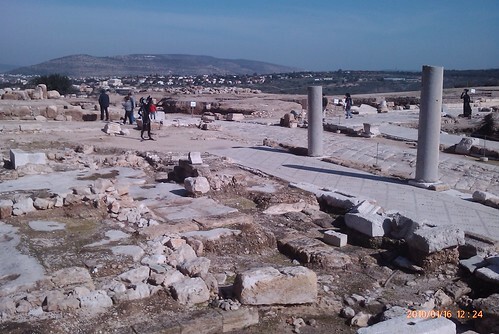 In return the city was saved and renamed Eirenopolis or “city of peace” as evidenced by coins minted in Zippori during that period. The city had developed into an essential site, in the Land of Israel, for Jewish religious and spiritual life during the second century. The Bar-Kohba revolt of 135 introduced an influx of jewish refugees into the Galilee who by the Third Century were the town’s majority. Rabbi Yehuda Hanasi, who also redacted the Mishnah, headed and relocated the Sanhedrin (Supreme Jewish religious and Judicial body) to Zippori during the Third Century. Long after the Sanhedrin was moved to Tiberias, Zippori retained its status as an important center of Bible study and many prominent sages taught in its academies. Zippori was an important trade market for traders due to it being strategically located on and around major trade routes. Zippori National Park, encompassing the ruins and archaeology findings of the ancient Roman- and Talmudic-era city of Zippori, is located in the rolling hills of Lower Galilee, west of Nazareth.